SpaBoom has released its instant online gift certificate software for spas. Now spa clients can order spa gift certificates online then email or print them right then, providing instant gratification to spa clients and simplifying gift certificate fulfillment for spas. 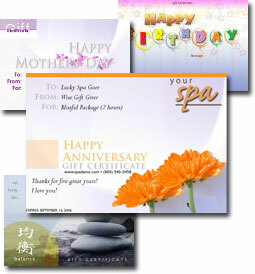 SpaBoom makes it easy for spa clients to buy online gift certificates. Â Albuquerque-based software developer SpaBoom has officially launched its online gift certificate software in the spa industry. SpaBoomÂs instant gift certificate functionality drops right into a spaÂs existing website, with minimal effort on the part of the spa. Feedback from spas has been overwhelmingly positive. Lori Costa with Cascade Gardens Spa comments, ÂWe sold an instant online gift certificate within an hour of going live with SpaBoom! SpaBoom has clearly filled an important niche in the spa industry. We're selling online GC's at all hours (even when we're closed), and out of town sales have risen dramatically." SpaBoomÂs instant online gift certificates allow spa clients to easily purchase and print or email gift certificates for spa services. SpaBoomÂs email delivery feature provides instant gratification to purchasers while saving spas time formerly spent on the customary gift certificate fulfillment process. A variety of gift certificate designs are available, and are automatically branded with the spaÂs logo at time of purchase. Spas traditionally use various methods to manage their gift certificate sales; SpaBoomÂs functionality complements any system, working within the spaÂs existing website. SpaBoomÂs reports provide spas all the pertinent details they need to ascertain status, expiration date, remind recipients of upcoming expiration dates, and manage their online gift certificate sales. SpaBoom takes spas online, providing tools focused on increasing online visibility and increasing sales. From instant online gift certificate functionality and management, to appointment requests, to dynamic website design, SpaBoom covers the bases. Simply put, weÂre here to make your website work as hard as you do to build your business. To learn more, please visit http://www.spaboom.com. Media contact: Stephany Toman, 800/940-0458, Ext. 803.